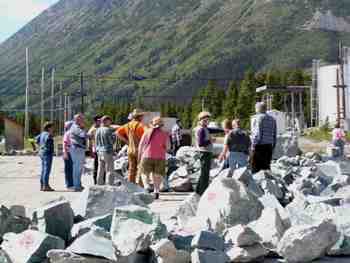 In the spring, a friend of ours, Win Robinson, invited us to join her and a few other rockhounds on a trip to the Yukon. We were supposed to join them in Prince George on Sunday morning, but as we were attending a wedding in Kamloops Saturday evening, that was impossible and we managed to catch up with them on Sunday afternoon in Kitwanga, which is about sixty-five miles east of Smithers. 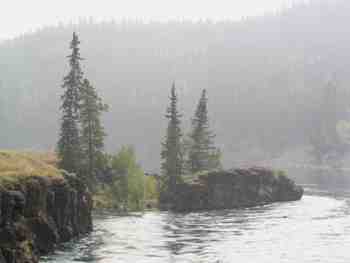 Between Smithers and Kitwanga is a narrow gorge in the Bulkley RIver at Moricetown where the natives use dip nets to catch salmon. 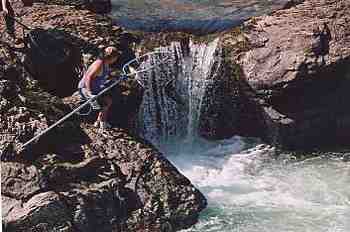 It takes a lot of skill and daring to scoop up a salmon as it tries to leap up this waterfall. 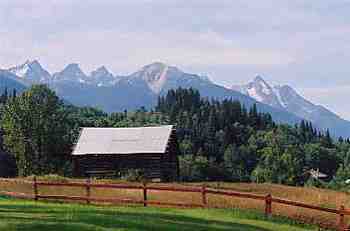 Kitwanga is a small town with a great view of the mountains. 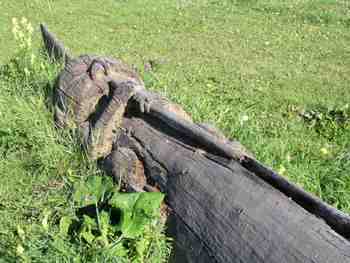 In Kitwanga there is a wonderful display of standing totem poles. 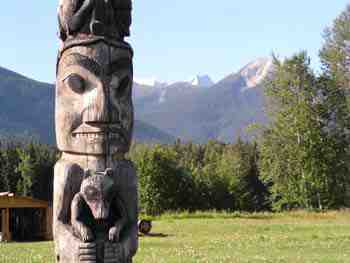 Not all of the totem poles are standing though. 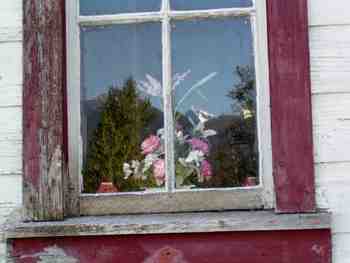 The mountains relected behind the flowers in the church window in Kitwanga. 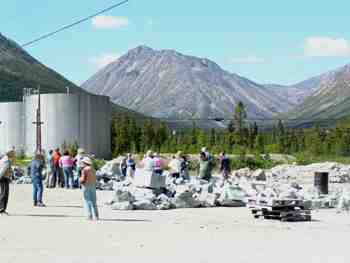 Win, who is also known as the Jade Queen arranged a tour of the Cassiar Asbestos Mine, which has been closed for many years. 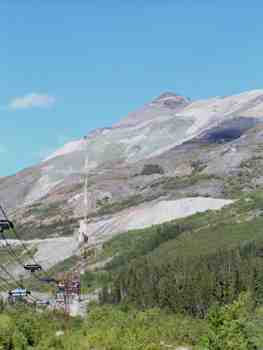 The cable car was used to transport the asbestos down from the mine area at the mountain top. There were about fifteen trucks in our procession up the road to the top. 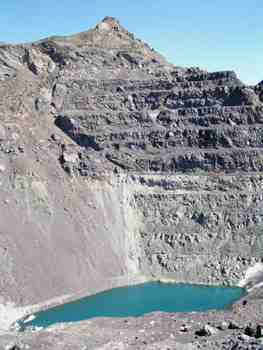 Now the tailings piles are being mined for jade which was simply discarded in the years of asbestos mining. The walls of the Cassiar Asbestos Mine are very steep and dangerous, which was one of the reasons it was shut down. 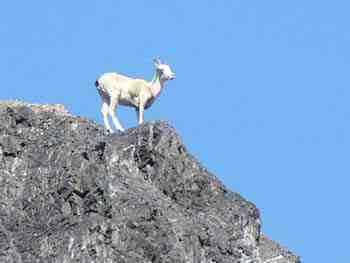 There were a few Mountain Sheep up at the top near the mine buildings. 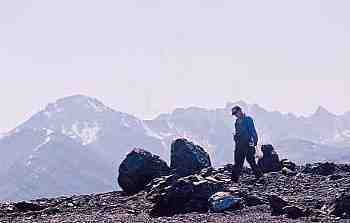 This rockhound is more interested in the rocks than the magnificent view. People picked up all sorts of samples of serpentine, some of which had asbestos veins running through. Back down at the bottom, the company was sawing up boulders of jade and some of the rockhounds managed to purchase some. Some of the jade pieces were still pretty large even after being sawn. 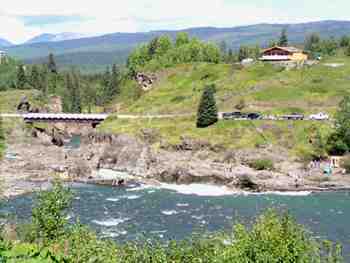 From Jade CIty we headed up to Whitehorse. This view is Miles Canyon and as you can see, the whole Whitehorse was covered with smoke from a series of forsest fires both in Alaska and the Yukon. 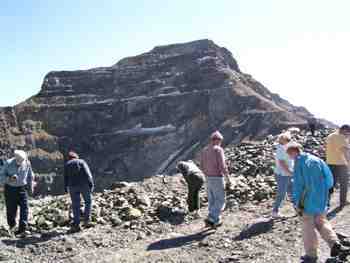 There are many abandoned copper mines in the Whitehorse area. 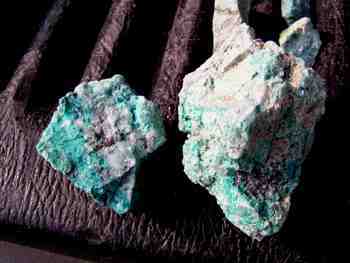 These are a couple of samples of Malachite from one of them.